It's a whole new day here for us as the JCP website refresh goes live. Over the past few months we have been working closely with Eight Hour Day to refresh the website including a revamped "Archive" section with numerous new galleries of imagery as well as an all new "Motion" category. Nate and Katie at EHD have been behind almost every element of JCP design for close to 10 years. I can't imagine the business without their insight, amazing talents, and friendship. The highlight of the new "Motion" section is the JC|P MotionReel. The reel has been a long time in coming and is finally available for viewing along with all of our previous motion pieces. Adam and the team at Elemental Motion Media once again surpassed all expectations in terms of the final edit and are always bringing something new to the mix; their editing, audio, and animation talents have always paired with the design elements from EHD in such amazing ways. The site has been restructured from Flash to HTML 5 which will allow for viewing on mobile devices i.e. smart phones and tablets. The behind the scenes credit for the coding / rebuilding of the site goes to John and Martin at Kilohq who have been great to work with and have come up with solid alternatives to the original flash based site. Thanks guys for weathering the numerous tweaks and subtle design changes. No one I've ever met understands the back end of the web more than these guys. I would also like to recognize the tireless internal efforts of John Fontana. He has been in constant "update" mode for quite some time as well as integral in communication between myself, EHD, and KiloHQ. John always sees what we all seem to miss, whether pairing images, writing / proofing copy, or suggesting something totally foreign, he has been the backbone on all things JC|P for quite some time. A new print portfolio is also on the way back from the printer which will coincide perfectly with the new website updates. It's been a busy time but an exciting time for us here and we are very excited to share the new content, design, and layout. Enjoy the new site and of course any comments or feedback are always welcome. Next up on the schedule is a project for Cedars-Sinai Hospital in Los Angeles that will take us up to the Labor Day Weekend. I am pleased to have been invited to speak as part of the APA / Apple Store Fall Lecture Series: "Discussion On Motion." The lecture will take place at the Lincoln Park Apple Store in Chicago, IL on September 26th at 7:00 PM. It is truly an honor to be brought on by the Midwest Chapter of the APA, and to share the series spotlight with Vincent Laforet. If you are able to be in the windy city on Monday September 26th and would like to know more about the realm of HDDSLR Motion and how it's inspired and broadened almost everything we're involved in; I encourage you to join me for an evening of sharing and discussion. Look for upcoming reminders via our social networking sites and here on the blog. I hope to see many new and familiar faces in just over a month. The next blog post will unveil the newly refined JCP website with many updates including the addition of the JCP Motion reel. We've been staying busy behind the scenes and in between projects. Looking forward to days ahead! Travel and projects over the past few years have taken us along Interstate 10, in route from Los Angeles heading southeast towards Palm Springs, California. Along this route, amid the desert landscape, the highway slowly unveils thousands of white blades rotating in the distance. The San Gorgonio Pass wind farm, home to more than 3000 turbines is situated in a valley adjacent to the San Jacinto Mountains, which is one of the windiest places on earth. These propeller topped giants stand out not only from their sheer numbers but also their gargantuan size. 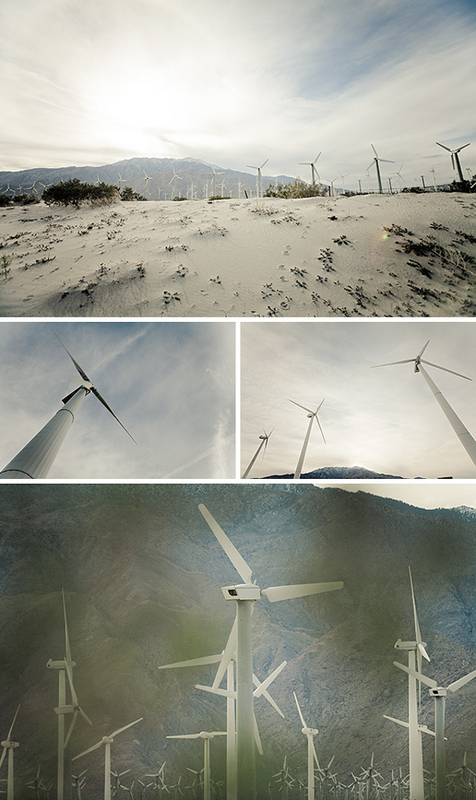 The wind farm generates enough electricity to power the entire city of Palm Springs and beyond. In order for the blades to turn, the wind must be blowing about 12 to 14 miles per hour which is then transferred to a collection point below and sent to a sub-station. This geographic location is unique as the wind blows hard enough to power the windmills over 300 days a year. On a visit through the area earlier this year, we spent some time at the wind farm shooting a collection of motion and audio clips; working to capturing the inspiring presence of the blades from as many unique vantage points as possible. Like many of the personal projects undertaken, there is a vague idea as to what will come to life with the final visuals. In between projects we were pleased to once again collaborate with Adam Duguay and his team at Elemental Motion Media. They not only combed through the footage and delivered several rounds of edits, but mixed and mastered the audio with some effects that accentuate the imagery. Smiles, laughs, and good times may be the best way to sum up the experience while working with some amazing seniors for UCare via Initio during the first half of this year. I think this may be one of the more unique projects in terms of time spanning different seasons, locations, and our subjects. We began in the dead of winter on the north shore of northern Minnesota, kicking off the campaign in Duluth and then traveling to Blue Fin Bay, over to Nisswa, and finishing up the northern loop in Aitkin, MN. As we headed out early one morning the outdoor temperature was -27º F! For a moment we thought it was incorrect, but one brush of the cold on your face and it was a sober reminder of how true it was. As the weather warmed up, we set out on the southern Minnesota tour which took us to Mankato, Faribault, and Winona. We even managed to see a little bit of our neighbor to the east with subjects in La Crosse, and Eau Claire, before heading back to the Twin Cities. With the promise of summer on the horizon, our final chapter took place here in the Twin Cities. We spent time at the Como Conservatory, Stone Arch Bridge, Gold Medal Park, and One Yoga studio finishing what we had started several months ago. As a whole the project couldn't have gone smoother - thanks to our hearty subjects and crew. We were sorry to see this project end. Next week takes us on the road shooting location / lifestyle imagery for Lowe's.